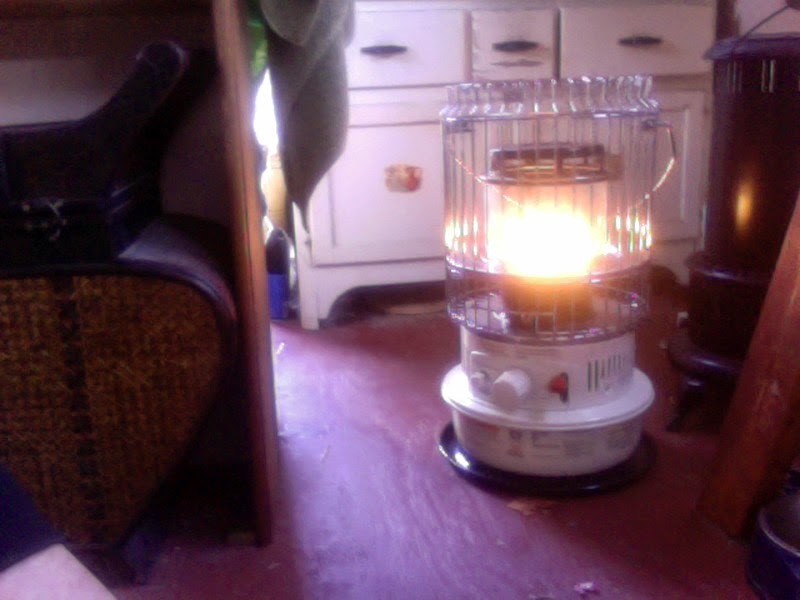 Well, being entirely happy with both our kerosene Butterfly cookstove and our borrowed kero heater, we bit the bullet and purchased a new 10,500 BTU kerosene heater (partly so we could return the antique one we were using to our neighbor here at the Marina....thanks guy). The new unit is a Dura Heat DH1051, which produces both convection and some degree of radiant heat. We've been very pleased so far. 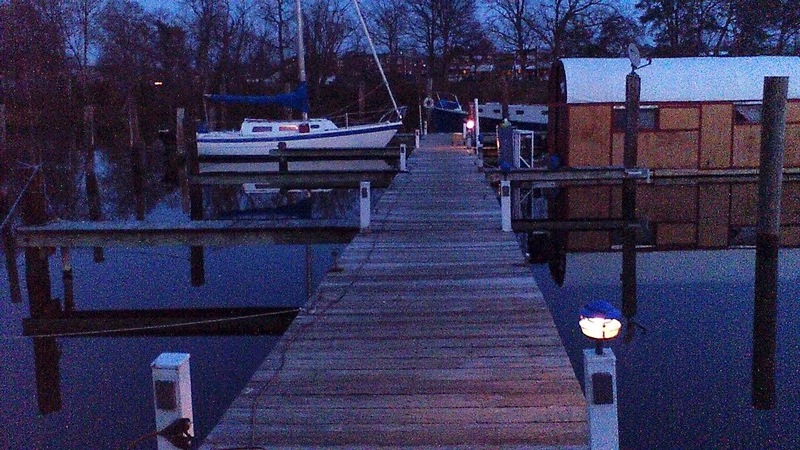 We did an overnight test and had to turn the thing off because it got our 220 sq foot shanty boat uncomfortably warm. As we are headed into temperatures in the teens, we'll give you a full report. Does it smell? Not if it's working properly. You may smell the kerosene briefly when the heater or stove is lit or shut off, but not while it's working. If you do, something might be wrong. About once a week, you'll need to "burn off" the heater. This involves letting it burn dry, which then causes carbon and tar deposits that may be on the wick to burn off as well. This DOES smell, and when it gets down that low, I'd recommend setting it outside until it goes out. Wait an hour, then try to relight the wick without refilling it. If it still burns a bit (it won't do it for long) it's burning off the last of the carbon deposits from the wick. Then refill, give the wick time to reabsorb the kerosene (again, about an hour), and relight. This will keep your wick healthy. All this means, of course, that either you do it when it's warm, when you're out of the house, or with some alternative heat source available. In the US, Kerosene (K-1) can be bought prepackaged (spendy !) or at a pump at some gas stations. Some of the Kero, by law in some locales, is dyed red so it can be differentiated from Gasoline. This really doesn't affect the burn. Water content, on the other hand, WILL affect the burn, and damage your wick. Unless you're very sure of the source, I'd recommend getting a filtering funnel that removes water. In Europe and other parts of the world, this is known as "paraffin" (in the US, Paraffin refers to wax). These heaters are really common in Japan and you can even get kero from vending machines there. This is a very pleasant heat. It's dry and silent and very, very safe (knock over the heater, and it shuts down instantly). Kerosene is not volatile like gasoline, it is far more like lamp oil. Unless dispersed by a wick, it will not burn. You could fill a bowl of the stuff and try to light it all day. Put a wick in said bowl, and you have a lantern. We've been very lucky thus far with winter. Its been very mild, somewhat foggy, and entirely endurable. It looks like mid-January will be far colder, but there still is no violent weather or massive snows in the forecast. Hey, check out our other blogs: Onboard Cooking has some great new recipes, and Morgainne's blog of art on the water Life, Art, Water has some great new stuff as well.